Small citadel? This one's huge! It's a fine place for political intrigue, bloody insurrection, or whatever other plots you can come up with. Publisher's blurb: "Welcome to your favorite base of operations: the Citadel. This small citadel is a perfect headquarter for your party; also, within its walls, it may offer many opportunities to adventures who take home here. "The citadel flanks a river (or sea) and features a small port. Two gates lead the travelers into the walls of the citadel. Inside the citadel, you can found everything a small community needs: stables, forges, inns, a large temple area, a lord's house, gardens, wells and more. 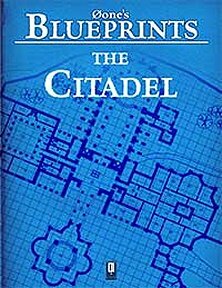 The citadel could be the keep of a larger city surrounding it or simply a small town, perhaps an extension of the lord's keep. The citadel features two levels (ground level and first level) and a roof level is also provided. Below the ground level, you can found a cavern complex that links with the manor's dungeons and a small sewer system."